Model TY783 is an immersion temperature sensor. 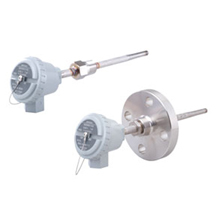 Its Pt100 resistance (equivalent to JIS* C1604 Class A) output, in combination with a electronic device with Pt100 input, is used for temperature control, indication, and recording of the process fluid in a pipe, tank, or heat exchanger. Model TY783 is also used as a temperature sensor for a duct or chamber. * JIS : Japanese Industrial Standards.